Liven up your prayer life with some color and creativity. Whether you use a bullet journal, regular journal or planner, or just occasionally like to send notes to your friends, these sets of stickers are flexible and colorful and easy to use. Simply peel one of the stickers from the 8.5 x 11″ sheet, and write as much or as little as you’d like beside it. Makes a great gift, especially when combined with a journal and writing utensils. 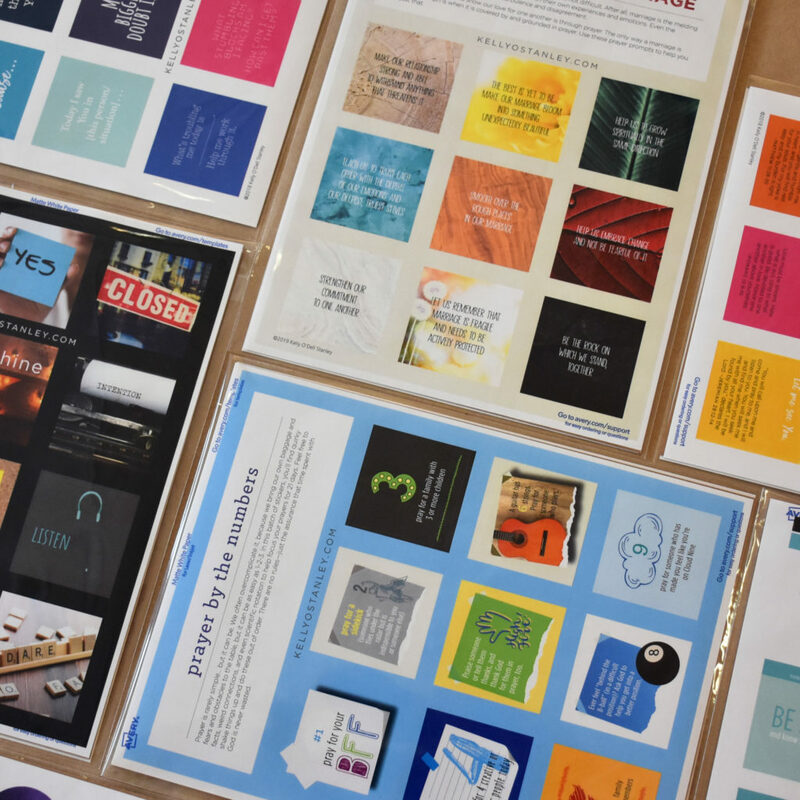 Square stickers are 2″ x 2″. Round stickers are 1.5″. Priced from $4-9 per set. 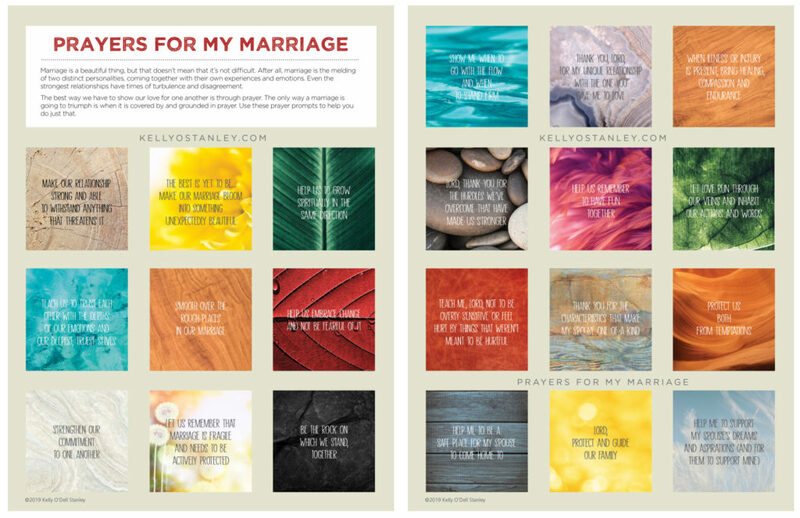 Let beautiful, soothing images from nature inspire you to pray new life into your relationship by praying over both your spouse and yourself. 2 sheets/21 stickers. Whether you’re looking for new depths in your quiet time at Lent, or just wanting to share the inspiration with friends, this set of 40 quotes will fill 40 days with introspective and inspirational thoughts on prayer and faith. 4 sheets/40 stickers. 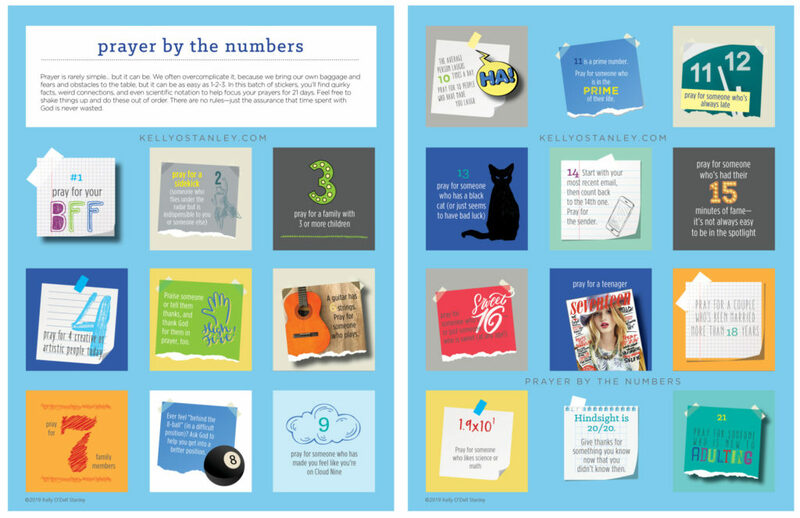 Praying can be as easy as 1-2-3 with these numbered prompts for 21 days. 2 sheets/21 stickers. 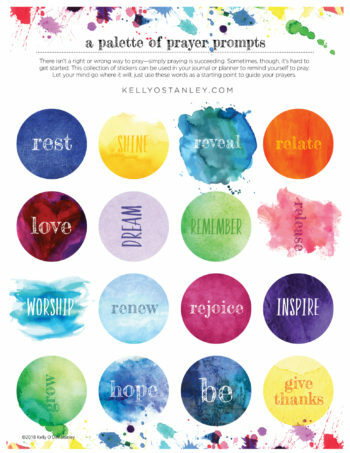 Use this colorful palette of words to inspire and direct your prayers, or simply to serve as colorful reminders to pray. 1 sheet/16 stickers. 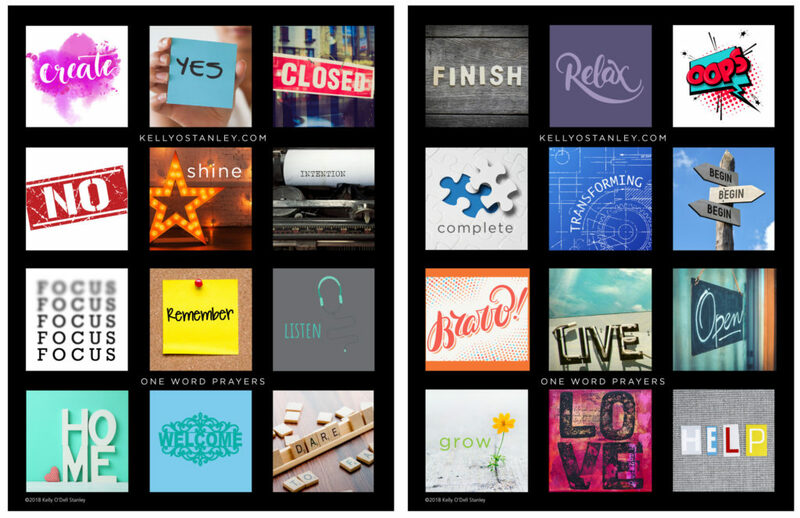 Bold and colorful, these graphic stickers simplify your prayers by directing you to pray about just one word. 2 sheets/24 stickers. Give the gift of prayer! Use these to put together a meaningful gift for a friend of family member. 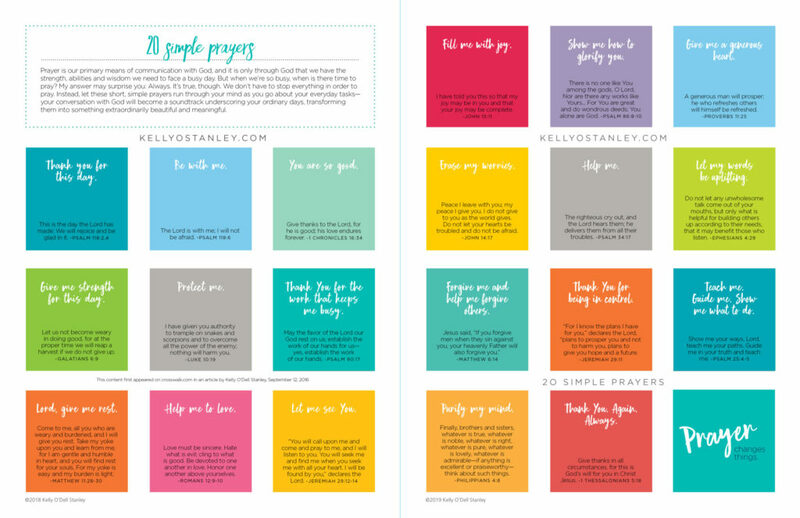 Simply place a sticker on each page of a small journal and write out your corresponding prayer each day. Several variations of stickers are included for versatility, allowing you to use these to create a journal for a friend or family member; someone who’s single or married; a person who is a parent or grandparent or childless, etc. 3 sheets/33 stickers. Short, simple prayers with a relevant scripture. Use in journals, on your calendar, in cards or notes to friends, or place on index cards and hang up for daily inspiration. 2 sheets/21 stickers. 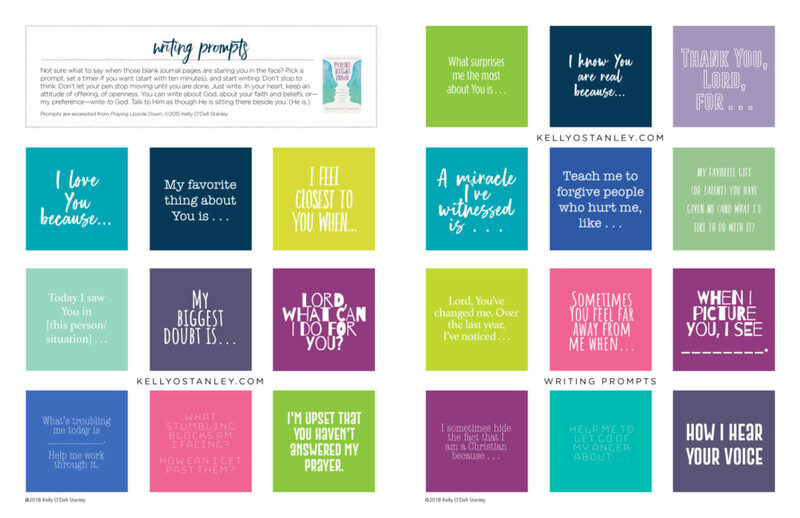 Taken from my book, Praying Upside Down, these writing prompts help you discover more about yourself—and, in the process, discover more about God. 2 sheets/21 stickers. 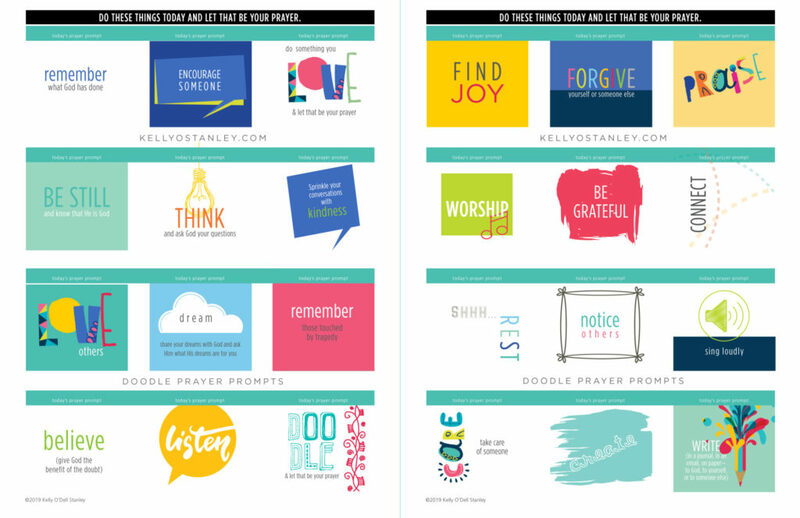 Have fun with these active prayer prompts, suggesting an activity to do each day to offer as your prayer—things like dream, remember, doodle, think, listen. 2 sheets/24 stickers.